Early in my career my mentor, Bernie Cunningham, used to arrange for those of us in the math department to present at the international Texas Instruments T^3 Conference. I was far from a model teacher, but Bernie would help me pick one or two innovative ideas I could share with others. Those excursions were unforgettable. I felt out of league at times, but we bonded as a department and our vision of what was possible was stretched. That was many years ago and I've since moved out of the classroom, but I've continued the practice of sharing my ideas at conferences. I also always ask other teachers in the district to present with me. I've been surprised at times by their unwillingness to do so. "I'm not techy enough to be presenting at that conference," they'll tell me. Or, "I don't have anything other teachers would care to see." I can relate perfectly to what they're saying. I still feel inadequate. But I also have seen the many benefits of preparing a presentation and putting the work out there to the masses. All I can say is it's well worth the risk. And there's always someone who thanks me for sharing. Recently I created this graphic to sum up some of those benefits. I'll elaborate briefly on each one below. It's empowering to know you positively impact several classrooms. - You see yourself differently when you know other teachers have learned from you. The thanks I receive at the end of my presentation, or maybe weeks later after they've tried out the activities I shared, help me realize what I'm doing for my students is worthwhile. Trying out your ideas with your class requires you to stretch. - Maybe I do this differently than most, but I usually submit a proposal to speak before I tried out my session topic. Or I should say, I always promise a little more than I've already tested out 100%. I tend to dream big on those proposals! When I find out my proposal has been accepted, I'm then committed to pushing the limits with that innovative thing I had dreamed up. I remember a few years ago when I received a grant in preparation for the conference. I had to deliver on the promise, but I was sick to my stomach with nerves the day we had to kick things off in class. I'm happy to say the activity and the conference session turned out amazingly well. It turned out to be an exciting experience, but I would have missed it had it not been for that requirement to present. You (and your students, colleagues and administrators) will know you're not just a good teacher in your classroom, your building or your district. - It is easy for a teacher to exist in a bubble. The standard of a "good teacher" is subject to our students' limited perspectives and our own limited view of the other teachers in our buildings. Giving something of value to even a small group of teachers at a conference puts those standards to the test. In fact, one of the reasons I submit my work for conferences is so I'm sure it's of value to educators beyond my district. The students I teach deserve such quality. Students are motivated when they know they play a part in a larger work. - I love to tell students that we are trying out something that I will share with other teachers across our state. It adds a lot more excitement to it, especially if I'm not sure it will work. They love to see how the project turns out and invariably they ask me later how the conference went. Some have talked to me about those projects years later. 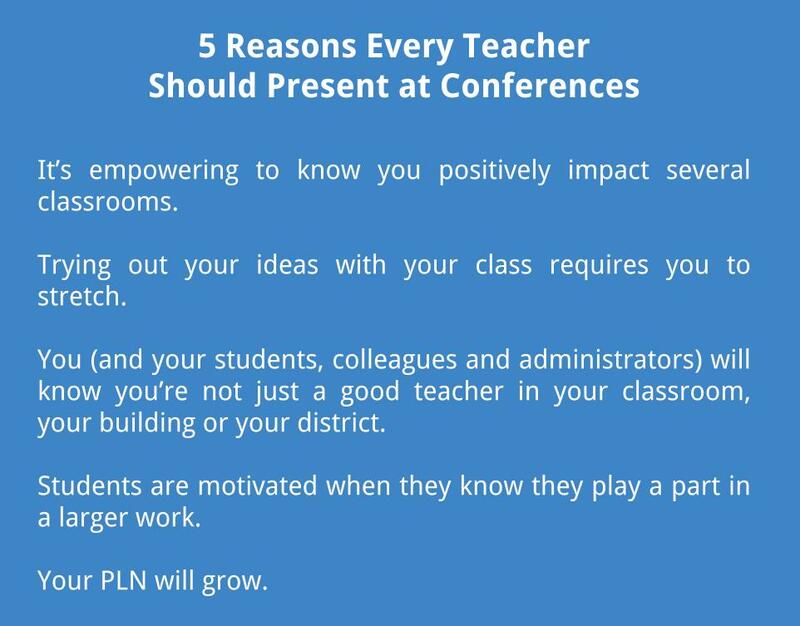 Your PLN will grow. 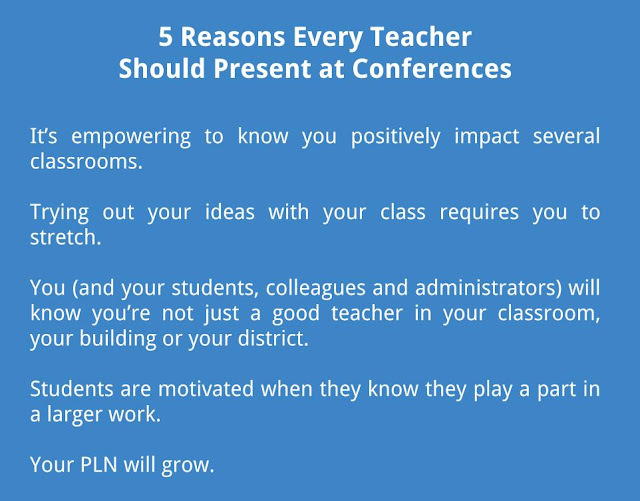 - We all know one of the greatest benefits of conferences is meeting other teachers. As a presenter, the opportunity for networking is increased. First, you are immediately recognized as a teacher of teachers. Many times just the badge around your neck will mark you as a bit of expert. You'll have plenty of opportunities to chat with other speakers. That chance to share ideas, or maybe just some laughs, greatly strengthens the bonds of the virtual networking that can continue past the conference. Of course, mentioning your Twitter handle and other contact information during your session gains more followers and increases opportunities as well. So I encourage every teacher to look for opportunities to present beyond their district. Partner up with someone else in your building. Start with a small conference. It will take extra effort and cause some extra anxiety, but the benefits can be life changing.